You are invited to a special “unveiling” of a new “9/11 MEMORIAL” to pay respect to those who died in the horrible disaster of the Twin Towers in New York City on that date in 2001. 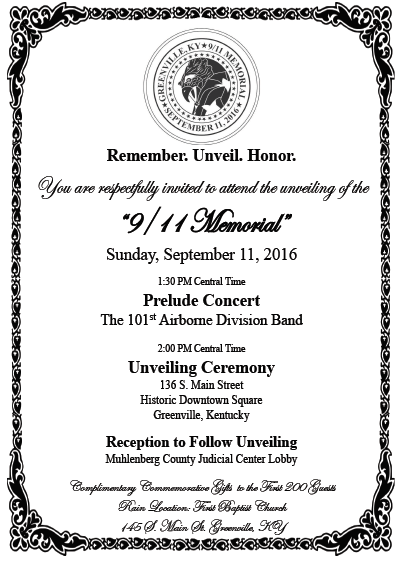 The hour-long dedication will begin at 2:00 p.m. on Sunday, September 11, 2016 in front of the Muhlenberg County Judicial Center in downtown Greenville. 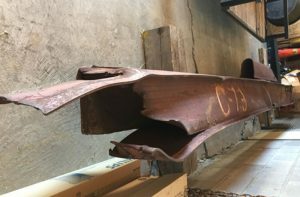 This massive 18′-tall memorial will include a 17′ box beam (pictured) believed to be from the 91st floor of the North Tower! Total cost of the memorial will be $110,000… all of which came from private donations rather than tax dollars. We believe this memorial is one of the largest ones in the State of Kentucky, rivaling in size and emotional expression… those erected in other states. Along with remembering those who died in this attack, the memorial will pay tribute to our own county 1st responders, including those who in the life-of-duty have paid the ultimate sacrifice.